This is a repost & update of a blog I did for Rob Rogers back in 2014 on how to ask a conference question. Sadly the original post is no longer available. Since then the tongue in cheek algorithm (see below) has been shared thousands of times and it’s been a lot of fun. In large part it’s been universally accepted as a bit of a laugh. There have been some people who just can’t see the funny side (seriously – some people think it’s a real guideline!!). That’s kind of funny in itself with one individual even claiming that it was the most stupid thing in the history of science. Yep,……in….the…..history…..of……science. Wow! That is some accolade and a real badge of honor, though perhaps a little underserved 🙂 In any case we thought it would be fun to repost and update. It’s also been taken on and shared by lots of people. That’s fine too as it’s not exactly our greatest academic work and won’t win any prizes, and it’s amusing to see evidence of the old aphorism that plagiarism is arguably the most sincere form of flattery. In truth I think the origins have been lost in the mists of the internet and so I’ve no problem seeing it pop up and get shared again this week in my timeline. However, seeing it once again has prompted me to repost the original blog after Nat found it on the wayback machine. Let’s get back on the time machine and remember where it originally came from, a conference, a tweet and a bit of fun with Rob Rogers aka @EM_Educator. To get you started we need to tell you a bit of a story. Sit back, relax, and remember a conference you’ve recently attended. Remember the feel of the seat and the hall. Imagine you’re back at the conference and a speaker has just given a reasonably interesting talk on something relevant to your speciality. You’ve listened and learned a few new things, heard a couple of surprising facts that you’re going to go away and think about. You’re just pulling out the conference program to see what’s up next and then the moment happens. The session chair invites questions……. Captain **&*%%&&ing Question puts his hand up again and you can’t quite believe it. He’s asked some form of stupid, irrelevant, annoying, self-focused question to every speaker in the session thus far. You scan the room for another hand, you pray that someone else, anyone else will think of something to say, to ask, something interesting relevant and useful to you or anyone else in the audience. You meet the session chair’s eyes as they scan past yours and in that brief moment you realise that you are on the same search, but neither you nor he find a palm of hope in the auditorium.Slowly, sadly, reluctantly the chair turns to the raised hand and utters the request for the microphone to be handed to Capt. Question. 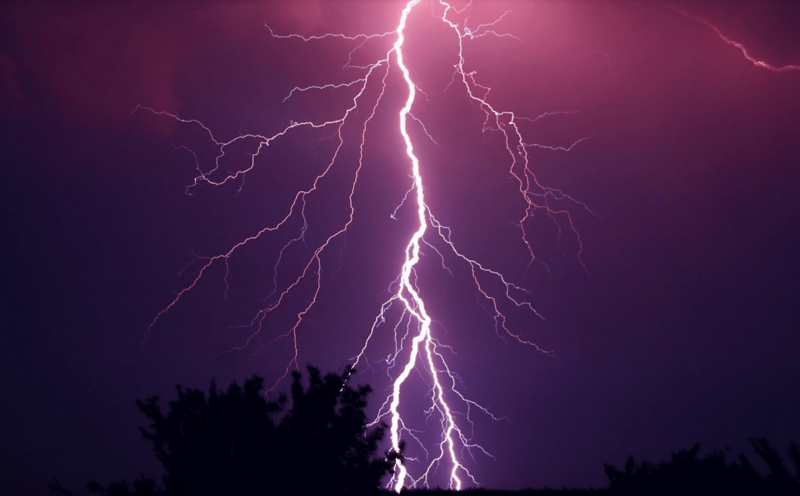 He take it in his raised hand, brings it to his lips and utters the immortal words that dishearten all hypo-caffeinaemic delegates..
At that moment a bolt of lightning defies the laws of physics and appears in the auditorium striking from the rafters to the very spot where Capt. Question sat. As the smoke clears the audience cheer and moves rapidly for the exit and coffee. Capt. Q has demised, perhaps by divine intervention and as the crowd leave they discuss the paradoxical feelings of relief and shame inherent in their Schadenfreude. Do you know a Captain Question? I’m sure you do, I certainly do and in all honestly I suspect that there have been times when I’ve worn that uniform myself (weekends only) but we should be able to do better. Conference questions are a tradition in medicine and it’s unlikely that we will be able to abandon them at any time in the near future, so let’s think about how we might do better. 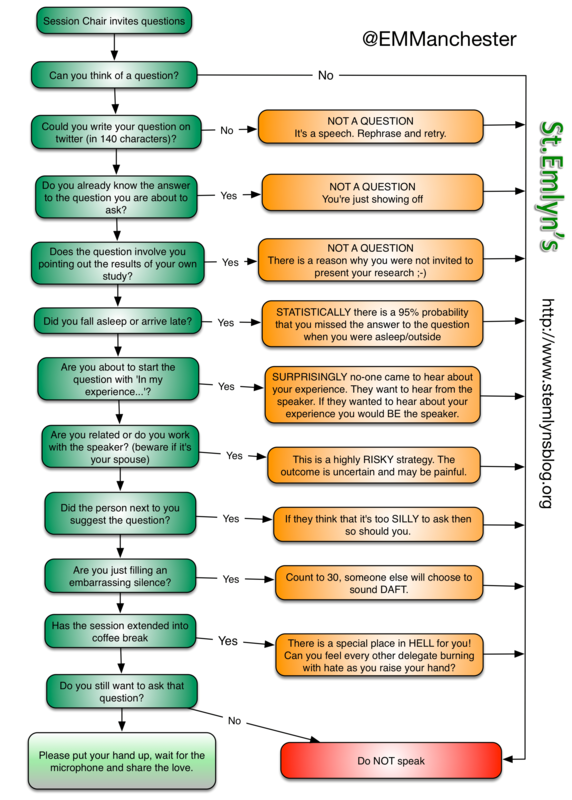 In the early dats of St.Emlyn’s I embroiled Rob Rogers and myself in a bit of a viral episode on twitter when I tweeted a tongue in cheek guide to asking conference questions. Here’s the original tweet from back in 2014. It was obviously designed to be an amusing aside between friends, but it clearly hit a chord with the world. To date the algorithm has been retweeted, modified and retweeted again many 1000s of times & in the early days nearly burned out Rob’s twitter account in the process. An updated version of the algorithm is shown below which importantly includes the issue of questions extending into the coffee breaks! Please feel free to use this in any talk or conference you attend, it may get a laugh and perhaps it might stop Captain Question in his tracks. Click on the algorithm below and you should be able to download as a png file. So, that’s a bit of fun around a serious point. Time is precious for all of us and time in conferences where we can learn, interact and network is precious, too precious for it be wasted by irrelevant self centred questions, but it’s not enough for us to just complain and poke fun. We need to do this differently. We need to find a way of making sure that everyone has an opportunity to ask questions, that they are relevant, that they can be managed as part of a conference program and for us to hope that they will add value for everyone and not just to the person asking the question. Is social media the bullet to fell Capt.Q? 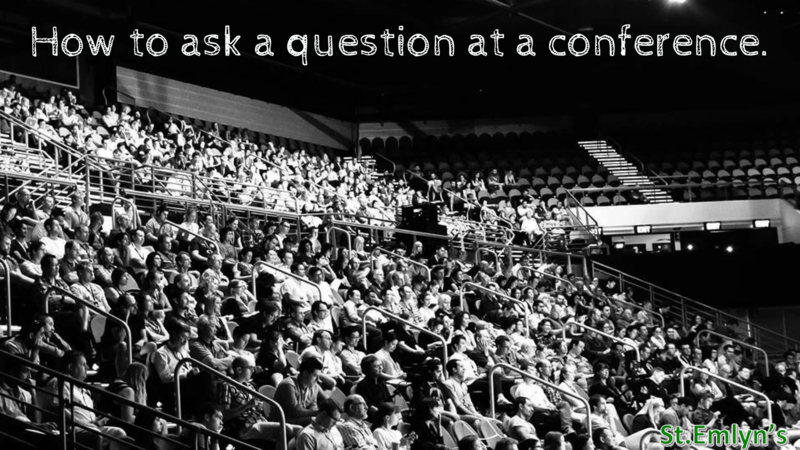 SMACC have led the way in incorporating social media into conference questions. I’ve used their ideas as a speaker, questioner and as a session chair and I’m a big fan. Here’s how it works. 1. Session chair announces in advance that questions will only be taken via twitter. 3. You need a separate ‘twitter monitor to assist the session chair. It’s too much for the chair to do both. 4. The twitter monitor selects questions for the chair to ask. 5. The chair asks the question on behalf of the questioner, ideally also identifies individual in audience so the speaker an direct the answer to them (that’s polite). There are clear advantages to this approach. It allows a degree of control and avoids the truly irrelevant conversations but there are potential disadvantages such as these. 1. You have to have a twitter account! Not everyone has an account and that may disenfranchise some delegates (though this is a diminishing problem). 2. The chair may paraphrase the question and get it wrong. Having said that questions should be clear if confined to 140 characters. If they are not clear then they are probably not a great question. 3. The chair/monitor choose questions that ‘they’ think are important and that may not reflect the views of the audience. I don’t worry too much about this as it’s progress over an unfiltered approach from the random questioner. Consider it peer review. 4. Twitter attracts lots of questions and they cannot all be asked, but that’s no different to a real audience and that’s what the coffee break is for! So, there are potential disadvantages, but on balance and having experienced the twitter solution to Capt. Question I’m a fan, and if like me you have experienced the burning hate of the irrelevant questioner you should really give it a try. If you want to know more about being a twitter moderator at a conference then please read this excellent guide from DFTB and Eve Purdy, Chris Nickson and Ian Summers. Remember that it’s not about silencing the conversation, it’s about enhancing it, focusing it and getting the most out of the time available for both the audience and the speakers. Finally, if all this is just a bit complicated I really do like the simplified version from our very own Chris Gray. Rules for asking questions at a conference. 1. Your first sentence should be a question. 2. There should not be a second sentence. We really hope you enjoy your next conferences and sincerly hope this does not put you off asking questions. We need the questions and debate, we just want the questions to be as good as they can be.